The post 1939-45 war Jaguar Mk IV was in essence the same vehicle as that produced before the war. Having said that it was such a good car and design that it still delivered the goods for the company now devoid of the SS tag and simply known as Jaguar. The Mk IV was produced with three engine variants, the 1.5 litre, 2.5 and 3.5. 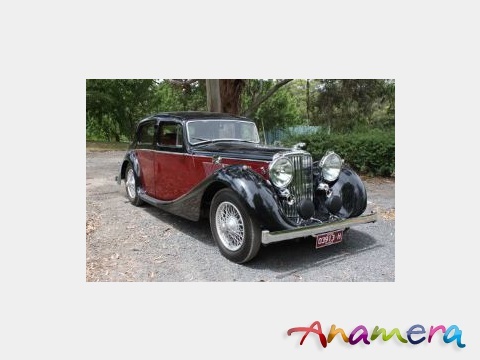 This marvellous 1948 Jaguar Mk IV 2.5 litre has had just four owners from when delivered new in Australia. Its current owner for the last 12 years is the distinguished actor John Wood. A 45 year veteran of the theatre Wood has appeared in hit TV series, "Power Without Glory", 'Raffertys' Rules" and the much awarded "Blue Heelers" for which he won a coveted Gold Logie in 2006. Finished in Burgundy and Black, this exceptional vehicle has been excellently restored including a new wiring loom. The car like its own is something of a star having appeared on the cover of the RACV calendar and having appeared in the RACV Club foyer and also in the concours of the 2013 Motorclassica.